Pretzel Logic's Market Charts and Analysis: SPX Update: Bears to Market: "You Can Pay Us Now or You Can Pay Us Later"
SPX Update: Bears to Market: "You Can Pay Us Now or You Can Pay Us Later"
Back in September, I suggested the end stage of the bull run (before a large correction) would be a fast and furious rally; a "blow-off top." Each day after, we continued looking for higher prices, as the blow-off top unfolded -- and in so doing, we captured well over 300 points of the ensuing rally. But on January 31, we changed our footing from bullish to bearish, and have remained longer-term bearish ever since (though after the February lows, we turned short-term bullish until March 5). Frankly, I don't care which direction the market moves, as long as I can make money trading it. Being a "perma" anything is stupid, because the market does not move in straight lines -- otherwise the 2007-09 bear market would have dropped to zero, and the recent bull market would have run to infinity. In terms of ease of trading, I actually preferred the extended fifth rally, because it was incredibly easy to make money on the long side from September into January. 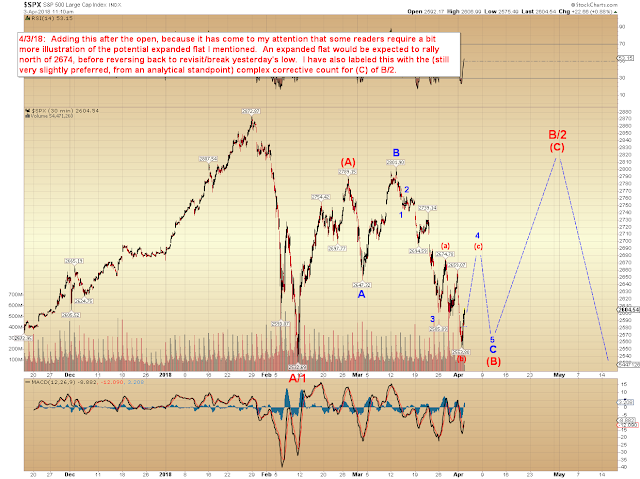 It was likewise fairly easy to make money over the last month, because we had two wave count options, and BOTH of them pointed toward a target of 2565-80 SPX, which was finally captured yesterday. More interesting than that target capture, though: The Dow Jones (INDU) briefly broke below the February low, which is at long-last a technical confirmation of my read that the decline from the all-time high into the February low was indeed impulsive (in the direction of the larger trend). That break does great technical damage to any and all bull counts (none of which we have favored since the all-time high), at least for the intermediate term. Bull counts have been reset in that index. That break also rules out a huge triangle fourth wave, which many technicians were trying to cram into this wave structure (I never felt the structure supported a triangle, which is why I never entertained that notion). The big question now is whether bulls can pull off some sort of near-term stick save before the wheels come off. The only approach I know to take when you're looking at a possibility that is near-term bullish but longer-term bearish vs. a possibility that is bearish across the board is to set up challenges for bulls to beat, and to maintain a bearish stance until they do. By February 2, we knew that the intermediate-term trend had changed from bullish to bearish -- and knowing that is 9/10ths of the battle, since you know at that point that any rallies are going to be against the next-higher degree of trend, and not with it. It's one thing to entertain speculation, but when it comes to trading, the benefit of any doubt must always go to the next higher degree of trend. So that's where we sit today. We just now captured my first downside target, and although I thought last week that there was a chance (C) of B/2 may have completed at 2585, we closed at 2582 yesterday -- so bears haven't missed much. I don't mean to imply that (C) of B/2 is off the table -- anything but. It is still very much on the table. 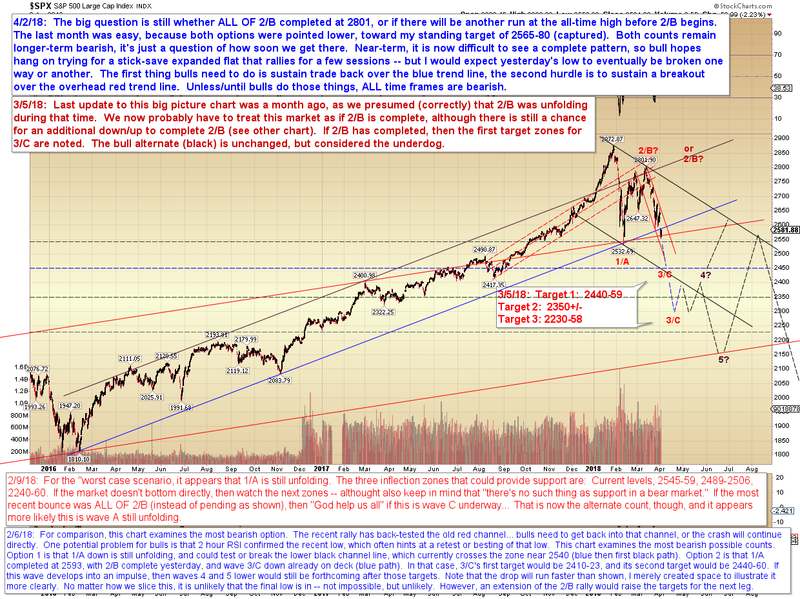 In conclusion, SPX captured my standing target, and INDU made a new low for the move, which moves the odds even higher (from my previous near-90% certainty) that the intermediate picture remains bearish. To separate the immediately bearish count from the "delayed" bearish count, we'll simply leave it to bulls to "prove" whether they can delay their day of reckoning or not. 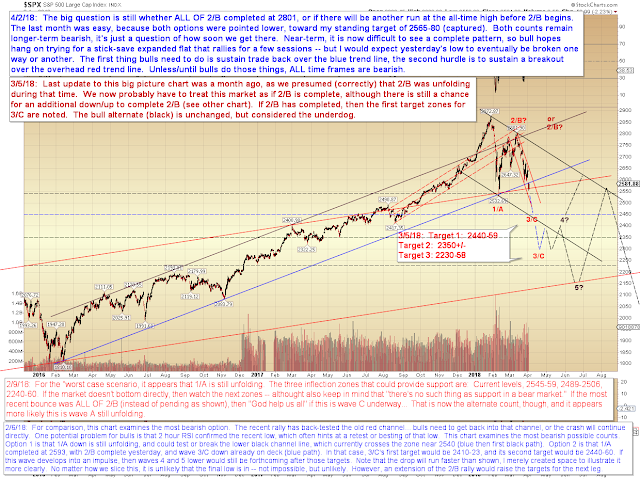 We will give the benefit of the doubt to the larger bear trend until they do. One interesting thing to note is that it's entirely possible that the reason this wave has been somewhat choppy is because it's possible that we have not actually seen the meat of the decline yet. In other words, as bad as the last month has been for bulls, it could actually get much worse over the coming weeks. And here, this is a fairly easy pattern in that sense: I see almost no options for any kind of lasting long-term bottom at current prices. Trade safe.